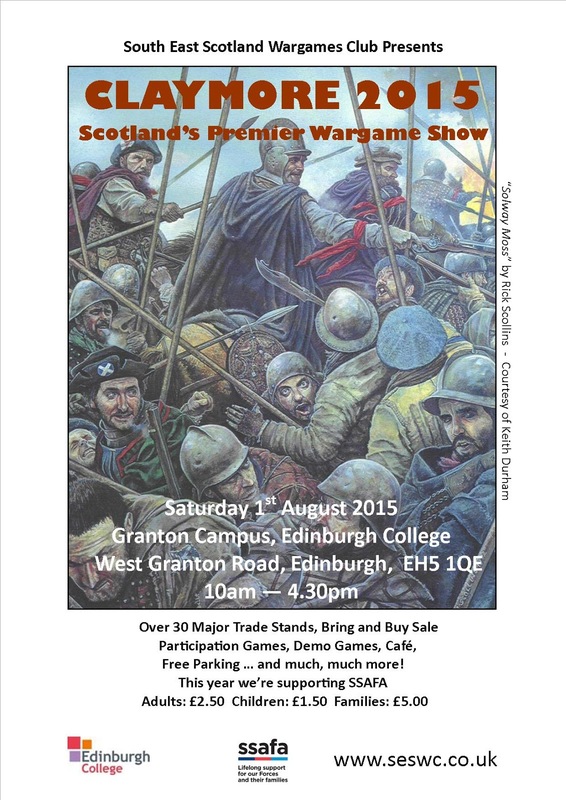 Just Add Water: Claymore, 1st August 2015- Always a Great Show! Claymore, 1st August 2015- Always a Great Show! I just thought I'd take the opportunity to stick in a quick add for my old club mates at SESWC who tirelessly run Claymore every year. This year the date lands of August 1st which is a great time for the show as he Scottish weather is usually something approaching it's best! There's always a great selection of the big names in wargaming in terms of trading and with the likes of Barry Hilton and Dave Imrie who have put on great games in the past it's a show not to be missed really. I'm also (hopefully- I need to gently remind him) be staying with a mate who knows how to use a camera much better then I and will be picking up the tricks of the trade so's to speak. Not that my photography is bad, but it could really do with improving. As I say, the show is usually excellent and it has the added bonus for me in that I'll be able to catch up with all my former SESWC club mates as well as others who's friendship I value a great deal from my eleven year stay in Edinburgh. New Wargames Standard, So Far, Not So Good!